Creamy beet soup is a crowd pleasure— even dudes like this magenta beauty! Put cashews in a bowl with warm water. Allow them to soak while cooking. Using a small amount of water or 1 tsp olive or avocado oil, saute the onions and minced garlic. While sauteing, wash and peel the beets. Boil until tender. In a blender, combine the garlic, onion, cooked beets, cashews, and water. Start with less water and add more as needed. Blend until smooth. 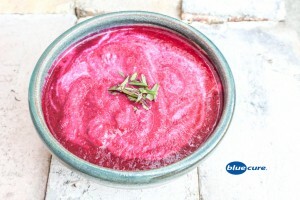 Note: * For nut allergies, omit the cashews and use 1/2 – cup canned coconut milk for a creamy beet soup. If using this variation, start with less water and add more as needed.